I escaped that milk crate with burns over 70 percent of my body. I had to get back to my little ones to nurse them and I did. A nice lady saw what happened to me and called the Baltimore police. Those very sick young men were arrested, and my babies and I were delivered into the loving arms of the Baltimore Animal Rescue and Care Shelter (BARCS) folks. Drs. Seibel and Mammato and all the BARCS staff pitched in to save our lives. One of my angels didn’t make it. But three of my kittens, Grey Boy, Stripe and Mini-Me, pulled through with me. Two months later, I was done with critical care and it was definitely time for my children to start their grown-up lives. They got adopted and I went to my forever home with BARCS kitty volunteer, Cindy. Well, was I in for a surprise! I would be sharing my new home with five feline rescue siblings and a rescued pit bull. That would be 70 pounds of barking Bodie. I quickly discovered inherent danger in my new home. And, it was not Bodie. Sister kitty Bad Alice whacked me on the nose. Then she went and whacked Bodie on the nose. Bodie just kept smiling. I, on the other paw, whacked Bad Alice back. There can only be so many bosses in one house. It turns out Bodie is inherently dangerous to some things, though. Drinking glasses set on low tables really take a beating when her tail is wagging hard. And, the neighborhood foxes that want to snack on me and my kitty brothers and sisters know that Bodie is dangerous. Other intruders have to be very cautious, too. They are at risk of drowning in Bodie slobber. I am very particular about who I hang out with. Sister kitty Soot will snuggle with me when the clean clothes are in the laundry basket just out of the dryer. But, I reserve blanket-sharing privileges for Bodie. She respects my space and watches over me at the same time. It’s hard for me to believe anyone would consider all of Bodie’s “breed” inherently dangerous (see “Taking Action in Maryland”). Teenagers carefully planned and carried out my torture. Yet, we don’t label all teens inherently dangerous. People who have no empathy for animals and other people are the ones who are inherently dangerous. Dog owners who train their animals to be aggressive fighters are inherently dangerous. Just what do we have to do to get the message across to our lawmakers and judges? My voice may be a small one. But, if we add all of our voices together, we’ll make a noise so loud that the people in authority won’t be able to ignore us. You’re the consumat survivor, Mittens, and you deserve your safe & happy new life. Just be careful around “inherently dangerous” Bodie, or you may get savagely kissed! Couldn’t have said it better Mittens! An important lesson and challenge for us all! You tell ’em Mittens! We will too! @CandyWoodby Mittens is a very wise kitty. We can all take a lesson from Mittens! Incredible story, Mittens. “Inherently dangerous”…right! 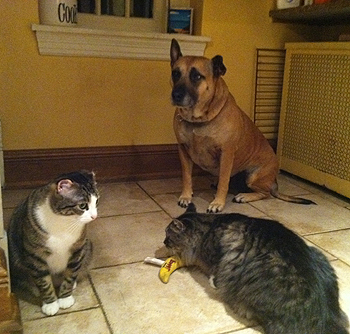 Cindy is an awesome advocate for cats and BARCS- I love it the most when she tells people she has a pit bull though. The faces! 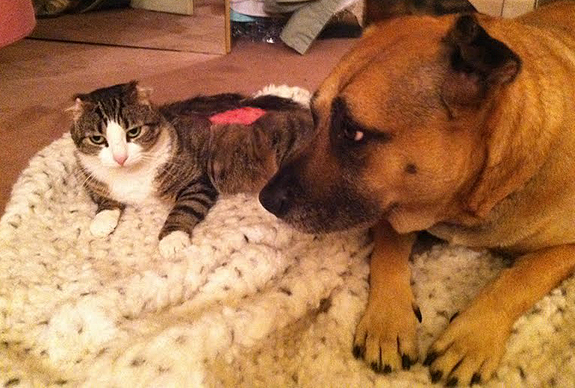 Mittens, be sure to protect “inherently dangerous” Bodie from “Bad Alice”. @Matt.S i do! i put bad alice in her place! @sammiesmom. Good for you Mittens! Bodie’s blessed to have you as a friend. 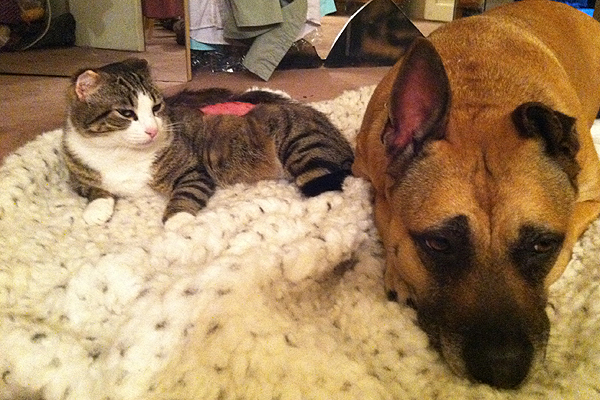 And Mitten’s BFF is a pitbull. My heart sings. ♥ shared on FB for awareness and combating ignorance. @Arleen J Rutten Thank you so much for sharing Arleen, that’s what we are all about, sharing wonderful stories to change people’s perceptions! WE love our fans!!!! From Henry, Winnie, and Kit Marlowe.